The Bucks Stop Here ~ Roundball Manor - The House that Basketball Built. 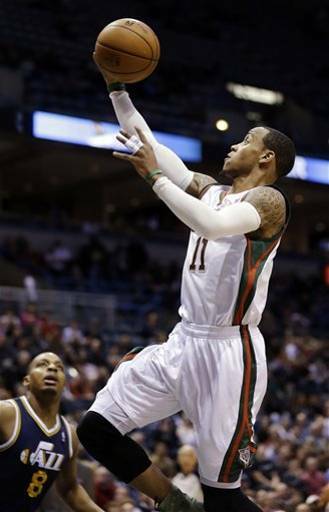 Since the acquisition of J.J. Redick, the Milwaukee Bucks are looking like a brand new team. Brandon Jennings has continued to develop his game as a team leader and facilitator, Monta Ellis has been on a scoring tear, and Larry Sanders has provided the interior defense to give this team a much needed spark. The last two game saw Brandon Jennings dish out 17 and 19 assists, topping his career high of 14 on back to back nights. Known as a heavy volume shooter for most of his career, it is great to see his game develop since the team added another scorer in Monta Ellis last off-season. Together, they have learned to play off each other's strengths, both producing high scoring and assist totals while continuing to get their teammates involved. Now that they have a knock down three point shooter in Redick, teams have to guard him and its leaving Jennings and Ellis in single man coverage. Down the stretch in games they are playing small ball and controlling the pace of the game with their shooting and passing abilities. With Redick on the wing, Ellis has been going wild at the top of the key, averaging 22 points, 5 boards, 8 assists and 3 steals the past two weeks. They are playing unselfish, finding the open man, and making teams pay when they try and double team a guard. Lighting up box scores as the newly minted NBA player of the week. Their back-court has also provided them with a solid combination of defense and athleticism. Larry Sanders has been all the rage at this year's Sloan MIT Conference with the latest "interior defense analytics" giving Sanders praise as the best big man in the league with his ability to PREVENT shots close to the rim, not just alter them. Sanders currently leads the league in block shots and reduces the efficiency of shots that aren't blocked, which is more significant because it happens more frequently. So by doing these things at the elite level, he is giving Milwaukee the interior presence it needs as well as helping to start lots of fast break opportunities. Sanders backup Samuel Dalembert has also played as well as any backup center in the league this season, while forwards Ilyasova and Mbah a Moute continue to contribute in different ways. Ilyasova has a solid inside/outside game, and although Mbah a Moute doesn't break the box score he's usually guarding the opposing team's best scorer, playing great perimeter and interior defense, and running the floor. Currently the 8th seed at 30-28 and only 4 games out of the 4th seed, Milwaukee could make a nice splash in the playoffs depending where they end up. If they can slide up to the sixth seed, they could match up very well with the Knicks, Nets, or Hawks who have all been playing sub-par ball lately. If they continue to play solid Roundball down the stretch, a second round playoff appearance seems feasible. If they got hot at the right time and get a good matchup, perhaps an Eastern Conference Finals is in their future.